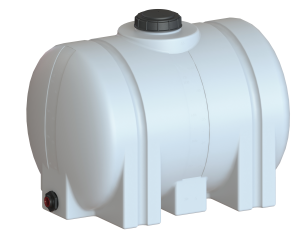 The 55 gallon horizontal leg tank is a freestanding horizontal tank with two legs for indoor or outdoor use, stationary or transportable applications. Two hoop band recesses are provided around the tank to facilitate anchoring. Gallon / Liter indicators are included on the end and side of the tank. Tank features end sumps on each end for fitting location. A centered side sump is also furnished.